If the premiums were deducted as wages by the S corporation, does the deduction taken by the shareholder reduce the shareholder’s stock basis? My tax software is producing stock basis worksheet and it shows a reduction for the medical deduction taken in addition to the ordinary loss flowing through on the k-1 which already takes the wage deduction into account. Does this seem right? There is an option to exclude SE health insurance from basis calculation but wanted to know your thoughts. The premiums should only be deducted once as wages. There should not be a separate medical deduction on the K-1. The medical deduction should only be shown on the W-2 in box 14. Once you have that fixed, the premiums should only reduce basis once. Our tax software does not even let us put a self employed health insurance deduction on the K-1 anymore for S corporations. That option is only available for 1065 K-1s, so not sure how your software is producing a separate deduction on the K-1. I would just find a way to delete or override it so that the deduction does not come through. Is the S corp shareholder’s health insurance premiums paid by the corporation still not subject to FICA if the S corp has other employees for which insurance is not provided? Thanks for your help. It would still be exempt from FICA, as it is not contingent on whether you have a group plan or not for the employees. Most small S corporations with a few non-shareholder employees do not offer health ins, and so you just reimburse the shareholder premiums and add it to the W-2. Even if you had a group plan or insurance through the S corporation, Section 106 allows you to discriminate as to what groups of employees are offered insurance, so shouldn’t be an issue here either way. Situation: Taxpayer is a 100% owner of an S-corp which is the only business the taxpayer owns. One owner receives a w-2 from that corp. The only wages listed in box 1 of the w-2 represent the amount of health insurance premiums that were paid by the corporation. Since such premiums are not subject to social security, medicare and unemployment taxes (and no other wages other than the premiums are reported in box 1), 0 (zero) is listed for the wages in boxes 3 and 5 of the business owner’s w-2 form. The business has a net loss for the year. Question: can the amount of the premiums paid (that are listed in Box 1 of the w-2 and on line 7 on page 1 of the IRS 1040) be claimed as an above-the-line deduction on Line 29 of page 1 of the IRS 1040 for the self-employed health insurance deduction? Or can such premiums only be deducted on Schedule A. I ask this because of reading some footnote that earned income needed in order to claim the Self-employed health insurance deduction on line 29 consists of Medicare wages in box 5, and not the wages reported in box 1 of the w-2 that represent the premium paid. If you look at the Self-Employed Health Insurance Deduction Worksheet in the instructions for the 1040, earned income for a >2% shareholder is Medicare wages. In your case, if Box 5 is zero, then the answer is no – you would have to move the deduction to Schedule A. My question is why the zero wage? Even with the net loss, the owner is at risk of a reasonable compensation audit with zero wages. I would just advise them to pay enough to take the deduction above-the-line. That way you take care of the health insurance issue and reasonable compensation. What do you do when a shareholder does not have a W2? Health insurance would have to be reported on Sch A then (see my comment in the reply above). According to the IRS, you have to have Medicare wages in order to claim the SE Health deduction, so it would have to go to A. Why doesn’t the shareholder has a W-2? Are they an active shareholder providing services? Did they take distributions? If so, they should be reporting some reasonable compensation on a W-2. Otherwise, a zero in the officers wages box along with distributions on the M-2 is a bit of a red flag to the IRS. If the shareholder is not an employee, do you still put it on the W-2? If not then what happens? If they are not an employee, are they just a passive owner providing no services for the S corporation? If not, they should be paid reasonable compensation from the S corporation – this is a basic requirement of the S corporation. I may sound like a broken record in all these comment replies, but zero wages for an active S Corp shareholder providing services is a red flag to the IRS and something they are currently looking at. Now to answer your question – if they are not an employee and have no wages, then no – I would not add health insurance to the W-2. They would not qualify for the self-employed health insurance deduction anyway, and the insurance would have to be deducted on Schedule A, so the extra steps of reporting on the W-2 are not really necessary. The requirement for the self-employed health insurance deduction on the personal return is that they have to have medicare taxed wages (box 3). Now, if they are owners of other pass-through businesses, and they are active in those business, they should claim the insurance through those business. 1. Health insurance is added on to the shareholders w-2, deducted by the S-Corp and deducted by the shareholder on his personal return. 2. 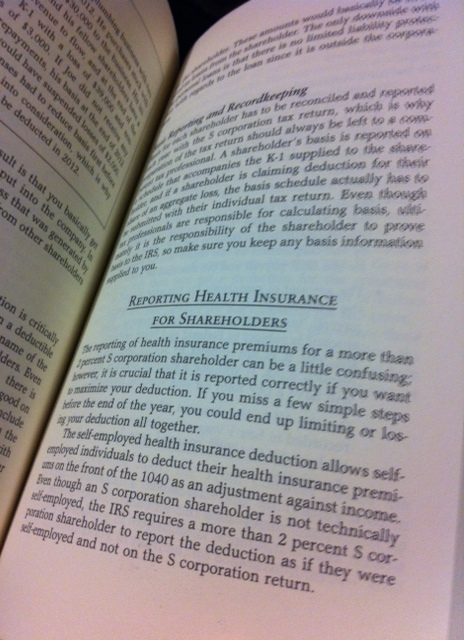 Health insurance not added to w-2, not deducted by S-Corp, but deducted by the shareholder on his personal return. I ask this because I forgot to add the Health Insurance to the shareholders W-2 and really don’t want to have to file a corrected one if the net results are the same. The overall result may be the same, but in an IRS audit, the IRS could disallow treatment as self employed health insurance health deduction and move it to Schedule A. That is your worse case scenario though. The more important question is whether it was paid by the corporation or not. If it was paid personally and not reimbursed, I think you have much more risk. The corporate reimbursement requirement is important, so even if you have to journal in the reimbursement when doing the S Corp return, it is important to show it within the S corp. Typically, what I do in this situation is report the shareholder health insurance as a distribution or as a non-deductible on the S return. Then on the personal I would pick it up the SE health deduction and argue it is part of the other wages paid on the W-2. If there are no wages at all, I think you are stuck with Schedule A treatment or correcting the payroll. I don’t blame you – payroll penalties are high and the correction forms take longer than the originals. Let me see if I get the K-1 (1120s) part now. Officer-shareholder pays $8000 in health insurance premiums. SCorp reimburses and includes 8000 in W-2 box 1 (but not 3 or 5), box 14, and in 1120s line 7. Officer deducts the 8000 on 1040 line 29. You’re saying that nowadays on the K-1, there is no specific mention of the 8000 (it only participated via 1120s line 7 in reducing business income), the words “health insurance” appear nowhere on the K-1’s, and there is no K-1 box to check regarding health insurance. Correct – that is the procedure, and yes – there is no box on the K-1 to put health insurance. The 1065 K-1 has a box for medical insurance, but not the S Corp K-1. Before they got strict on this, most people would add it as a memo on the K-1 and run it through distributions or show it as non-deductible. Now, the wage treatment is really the only way to go. Excellent, thanks for the quick follow-up. My perpetual doubt and confusion have been dispelled and whether I do it myself or have a pro do it based on my books, now at last I have certainty and clarity about how it’s supposed to be done. And I can sleep well about this year’s return. If the shareholder has no W2, on the 1120 would the health insurance paid then be coded as a nondeductible expense so it flows correctly to the M1 and the K1? Done this way it shows the book income with the deduction adjusted for the insurance in order to make the reconciliation balance to tax on page 1. It also seems to code correctly on K1 to put it on Schedule A…Hopefully this is the right path for this as I inherited this client.